Published February 6, 2018 Filed under Around The Web, Under Our Dome, USN Columnists. Total of 2 comments in the discussion. Ed’s Note: I extended Daryl Acumen the courtesy of reviewing and commenting or correcting this article. His quotes are from that interview. He also sent an email that addresses these issues. I have redacted the parts that don’t apply to this article. Here is that link. 3/19/2018 – Since this article was published, Acumen has sent out tens of thousands of spam emails to SCC mambers and others. He also tried to shop, to this publication and others, copies of Dave Bateman’s divorce decree that was unsealed long enough for him to get a copy of it. Whoever marked those divorce files as “public” should be the subject of a judicial review, investigated criminally, and be in jail. 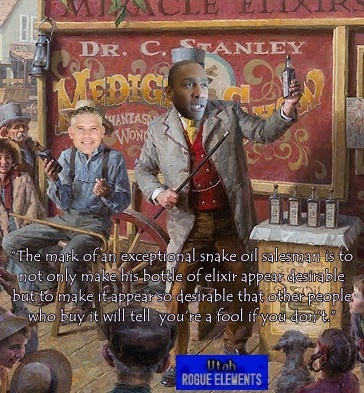 Who is Daryl Acumen? No one really knows for sure, or what lurks inside. His birth name is Daryl Bradshaw. As a teenager, he changed his name to Daryl Antoine Tremeyne Acumen. He reportedly picked ‘Acumen” from the dictionary because of its meaning: defined as the ability to make good judgments and quick decisions, typically in a particular domain. He reportedly has had over 10 variations of those names over the years, most of them simple variations. His current voter registration identifies him as Daryl Antoine Tremeyne Acumen living in Salt Lake County. He now plans to be working for Count My Vote (CMV-SB54) in the near future. He has posted on Social Media that he was joining and had flipped to CMV although claims he’s not yet received payment for his services. 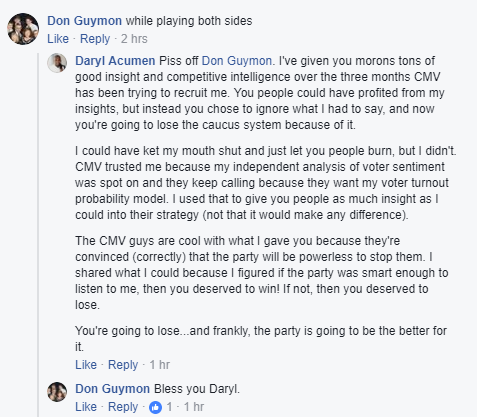 SCC members suspect he’s been using Party data to further the efforts of CMV. He has been consulting and performing other services for Curt Bramble, the father of CMV, for almost four years, having received $7,250, according to Bramble’s disclosures. Despite the acrimonious rhetoric he spews, GOP Chairman Rob Anderson added Acumen to his trusted inner circle, and made him steward over the Party’s data. After eight months of Acumen’s handling of the Party’s proprietary data, and largely due to Acumen’s antics and relationship with CMV, on January 27, 2018, the SCC formed and named the members of a Software and Data Committee to wrestle control of the Party’s data away from Acumen. Anderson petitioned the motion’s sponsor to add Acumen to the committee. The request was denied. If the information about him is negative, then it’s because that’s the way he has lived his life and conducted himself. He says anything he wants, despite how condescending, rude, non factual, and plain mean. The State Party Chair and Vice Chair both coddle and cultivate Acumen’s outbursts. (The Vice Chair said you are adults, so it doesn’t matter.) Acumen refers to people who disagree with him as crazies, idiots, brainless, stupid, morons, “you people”, etc. He has emailed GOP members to chastise them for not doing whatever he thinks they should. Concerning his use of child-like name calling, Acumen stated “Yes, I refer to the nuts by various names…but that’s because they are in many cases literally crazy!” Perhaps, the old adage of “I know you are but what am I” could fit here. In response to that comment, Acumen says “The paragraph about me being a narcissistic psychopath is just plain silly. I may be harsh, blunt, and forceful, but I am always logical and I usually only get really terse when someone refuses to see reason. My standard response to a passive aggressive attack is to just attack back. Because my response is very active-aggressive, I’m perceived as being mean. Personally, I don’t care.” Acumen provided USN with excerpts from speeches he made that he believes are the basis for the animosity toward him. 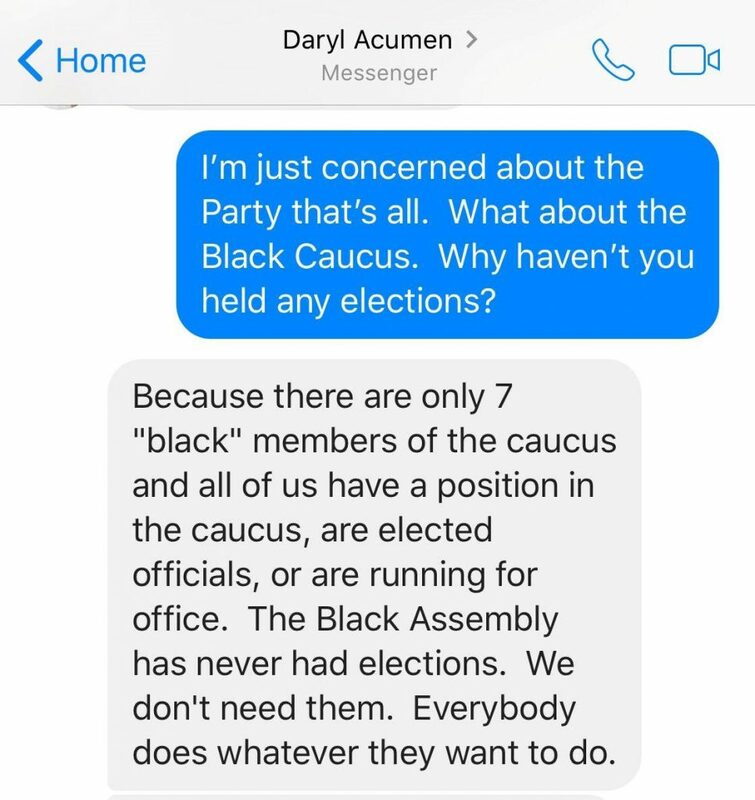 One SCC member member questioned Acumen about this asking “Why haven’t you held any elections in the Black Assembly?” Daryl replied, “The Black Assembly has never had elections. We don’t need them. Everybody does whatever they want to do.” He went on to explain that most of the members on the Black Assembly are white, seemingly including State Senator Curt Bramble, and blamed the lack of black membership on the LDS Church withholding the priesthood from black people until 1978, and the GOP’s opposition to the Civil Rights Act of 1964. Acumen is very tech savvy, and doesn’t mind stating (or overstating) his technical prowess. 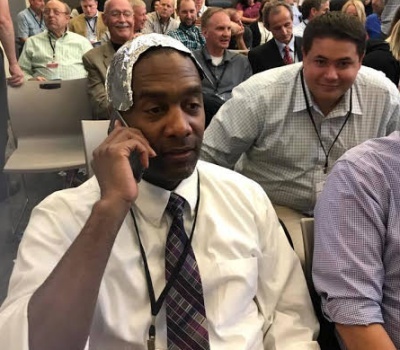 At the UTGOP State Central Committee (SCC) meeting last September, Chairman Rob Anderson created a wasp-nest when the Party “accidently” tapped into, eavesdropped, and monitored the phones and communications of all the SCC members in attendance. The monitoring was done on the North Salt Lake City Government server and Wi-Fi network. A court order is required to monitor activity on a government server. 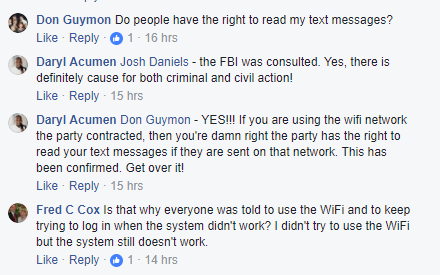 The UTGOP did not have a court order to monitor the electronic communications between its members. But, as the meeting was finishing up, Anderson stated that “things happened” with the program, that Giles and Acumen could attest that they “accidentally” tapped into your cellphones and that “we monitored everything going on in this room, we have that data, including text messages, and things like that”. After the meeting Anderson, Acumen, and Giles Witherspoon (who created the program that Witherspoon said couldn’t be hacked) attempted to cover it up by falsely blaming Drew Chamberlain and his son for hacking the servers, when they clearly did no such thing. They didn’t even have computers or tablets with them during the meeting. 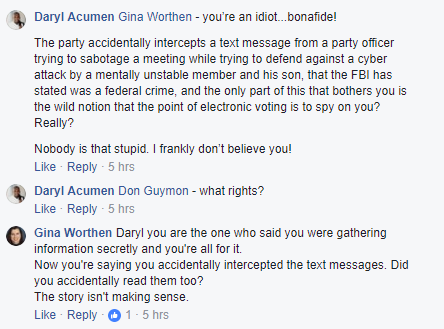 Acumen thinks it was legal to wiretap SCC member phones, because they signed into a private Wifi that the party had contracted with. However, the Party used a government network for their experiment. Acumen was heard to make statements, and he posted online, that he knew what was on the intercepted data. Acumen has moved around: as many as 9 cities and 23 addresses in 27 years. Records show he has been evicted in Utah County 3 times, although Acumen stated that they were just notices. He had 2 Utah State tax liens filed in 2011 that he claims to have paid, 5 civil and small claim judgements that have been released, and has at least 9 vehicle and traffic misdemeanors. This data could be overstated, although Acumen has admitted to being arrested and imprisoned for approximately 48 hours. The Utah County Republican Party has historically owned the domain utahgop.org., not to be confused with utgop.org that the state party uses. All counties had a domain with the name of their county prefixing “gop.” Utah County no longer owns the “utahgop.org” domain at Godaddy.com. Acumen purchased it at renewal from Godaddy in 2013 while serving as the Vice Chair of the Utah County Republican Party. 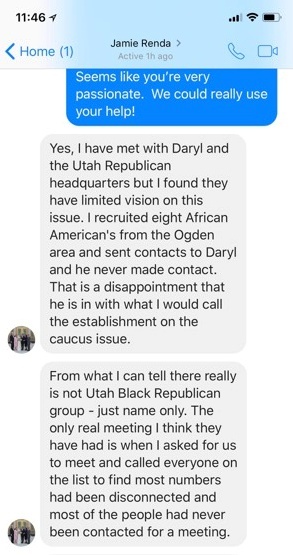 Many SCC members believe that he uses the utahgop.org email address to get people to give him info, taking polls, etc., by making it look like it came from the party and he has worked on many campaigns. (Related story: Who Owns the Utah GOP?). The GOP Salt Lake County relies on him for all of their emailing services. One SCC member asked “What will happen if Count My Vote sends emails from the “Republican Party of Utah”? 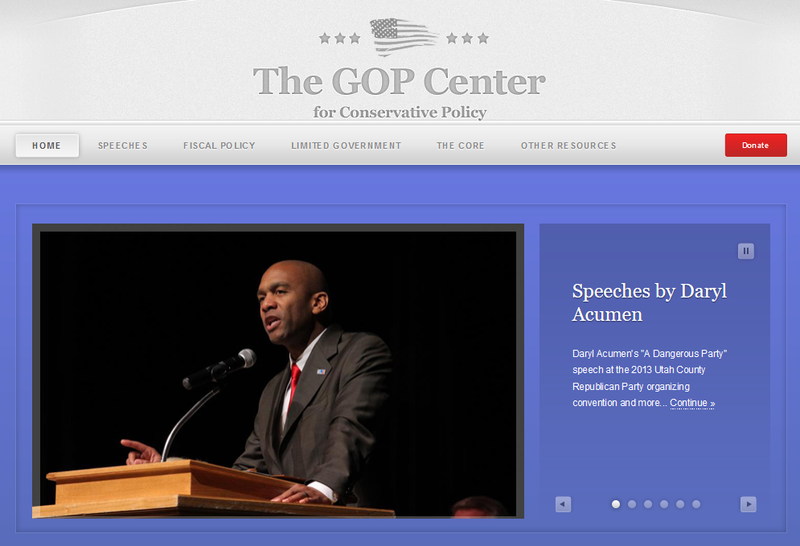 The domain (utahgop.org) had been held in the party since 1996 and now goes directly to Acumen’s ‘The GOP Center”. There is proof that the domain was officially used for the county party from 1998 to 2009. State Senator Curt Bramble, the father of SB54, originally bought the domain on behalf of the Utah County Republican Party. Acumen has told others that when it was expiring, he was tasked by Casey Voeks to buy a domain name for Utah County party use. Acumen renewed the domain in his own name. Voeks offered to repay Acumen, who replied that it was cheap, and to call it a donation. He didn’t turn in receipts for reimbursement. When he moved out of Utah County, he retained the domain and uses it for his own personal agenda and use in his consulting business. Voeks never called it back. The Utah County GOP were told countless times that they would get it back after Acumen tried to get $2,000 from the party to buy it back from him. Anderson has also stated, at least twice, that he would get it back. But, the Utah County GOP are still holding their breath. Use of this domain no longer represents the Utah County Republican Party who used this domain for official party emails. So, why would a private individual or an organization want to represent themselves as the official party if not to imply a deceptive support from the majority? Why is this a big deal? 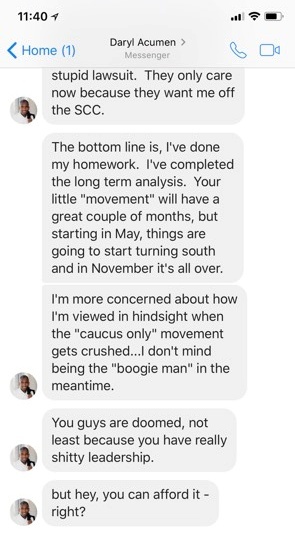 As Utah County Republican Party races were taking place in April, 2015, Party Chairman Casey Voeks was using utahgop.org (owned by Acumen) to send emails to delegates and Central Committee members. At the same time, some candidate hopefuls had engaged Acumen to run their campaigns and send out emails. Acumen was known to be proficient with technology, had a domain and had valuable access to registered party member emails and other personal information lists. A few of those candidates have reported that Acumen waived his fees to help them get elected. Some concerned citizen activists, who were aware of the situation, sent delegates an email that exposed this connection. They felt that emails from this domain were paid advertising by individuals in an attempt to deceive, mislead, and give a false impression to the sender of the email and the endorsement of the party. All of those running for party leadership positions that had retained Acumen’s services lost election, except those running for State Central Committee positions. 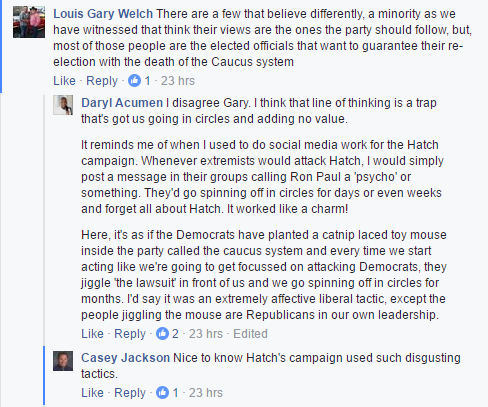 Shortly thereafter, other candidates in races in Salt Lake County and Davis County were endorsed by the UT GOP after receiving emails from utahgop.org. This resulted in big wins for Acumen’s candidates. And, this doesn’t stop there. A paid strategist, Sherrie Everett Hall, used Acumen’s email services to apparently fraudulently push the idea that the Utah County GOP supported Bus Rapid Transit (BRT) even though the Central Committee voted by 2/3 majority to oppose the BRT tax project. Everett is a former Provo municipal Council member and former Transportation and Mobility Committee chairwoman. She remains a member of that committee. “The BRT project is estimated to cost $150 million. About half of the cost will come from the Federal Transit Administration, whose program is capped at $75 million per project. The local match of $75 million will come from transit taxes already being paid and collected in Utah County.” The project now faces an $11 mil overrun. 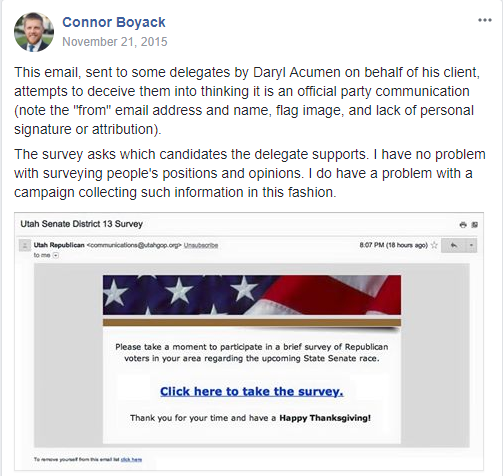 During his tenure as vice-chair, Acumen had access to the GOP’s Utah County delegate list and 145,255 (as of 6/23/2015) county GOP members, including their phone numbers, email and home addresses. Acumen’s services were retained by Jason Chaffetz in his re-election effort, which he won prior to abandoning his post a few months later. SCC members are asking: “Doesn’t the SCC have to approve Acumen’s involvement or can Anderson unilaterally keep going with Daryl?” The party officers are going to have to make plans to deal with the issue of “unofficial” use of the Republican Party “name,” by individuals and groups that do not represent the “official” Republican Party in Utah and Utah County. 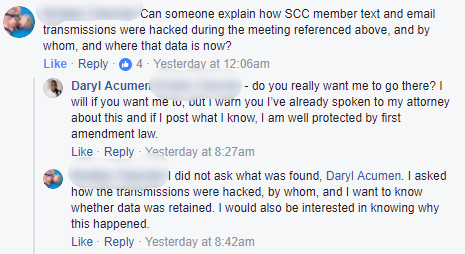 At the last SCC meeting on 01/27/2018, Acumen tried to get the SCC to reverse their decision on their defense of the caucus system and against SB54. Reportedly, his motion received 3 votes (Chairman Anderson’s wife, Kathleen, Dana Goff, and Acumen) and failed. Here is a video of that motion. Acumen also spoke (VIDEO) for seven minutes during that meeting. 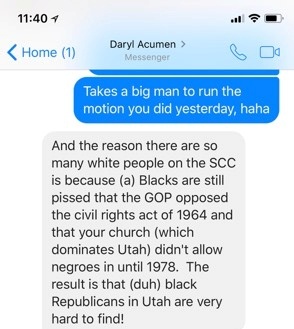 Acumen, as President of the Republican Black Assembly, a minority, also joined Joni Crane, Vice Chair of the Utah Republican Party, in voting against the Utah Republican Native American Caucus (another minority) to being an officially recognized auxiliary of the UTGOP. Under current rules of the Utah Republican Party, this action finally gives a voice to Utah Native Americans on both the State Central Committee and the State Executive Committee of the Utah GOP. Republican Natives members represent many tribes, including Apache, Cherokee, Utah Paiute, and Nez Perce. Note the official party use of the “utahgop.org” January 24, 2015. Also note the 2013 copyright Utah County Republican Party in the red bar at the bottom. Tamara Atkin also used Acumen’s utahgop domain to try to get elected. Any moron who spams my work cell-phone is going to get flamed. “Keep it up” at your own risk. I’m about to send Bill a BILL!!! Previous Report: AingeGate: Is the UTGOP’s Chairman Rob laundering money for Tanner Ainge? Next USN Endorses Travis Seegmiller to Replace Jon Stanard.